The Z1 LCD Screen connects to a USB port on your computer. It has its own onboard circuitry to power the 480 x 272 pixel display. When using the Z1 LCD Screen, the Z1 Dashboard software will automatically detect the screen and place the first instance of the running software on the screen. It will also use slightly less CPU time as it offloads some of the drawing to the screen's circuitry. 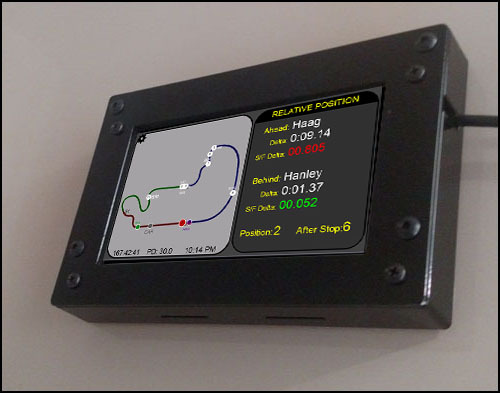 It is the perfect way to get the best from your racing sim dashboard software! The first time you connect your LCD Screen you will need to make sure the drivers are properly installed. Following these steps will ensure your screen is up and working as fast as possible. 1) Make sure you have downloaded the LCD Drivers and unzipped them. You can download the drivers here. 2) Plug in the LCD Screen to an available USB port. The Z1 Sim Wheel logo should appear on the LCD Screen. Note that depending on the number of current USB devices you already have attached to your computer a powered USB hub may be necessary. 3) Windows will search for a driver, but will most likely not find one. 7) Make sure the option to check subfolders is checked. 8) Windows will find the driver and install it. • Single USB connection makes connecting to your PC easy. • Wired connection prevents lag, dropped connections and interference from outside applications as occurs on phones and tablets. • Box Construction: powder coated aluminum. • Carbon Fiber: Optional carbon fiber front panel.